Super Fast. KingComposer utilises it's own unique UI core to bring you a highest performance, fastest speed and smoother Drag & Drop experience. HTML/CSS are minified before response to browsers, all custom CSS render into HTML, without waiting for loading. Maximum Optimization. We have a lot of features, but that does not mean that we are ponderous. Most of the action are processed immediately without delay and real-time results. Responsive ready. CSS Inspector is powerful tool for responsive tweaks. For row and columns, they had their own responsive options. Back-End and Front-End. Visual Back-End builder and Live Front-End editor, No programming knowledge required. You can build any responsive layouts with in minutes. 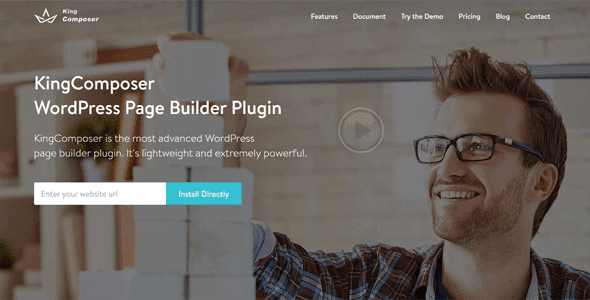 Easily build any professional looking Wordpress website within minutes. For theme author, business owners, freelancer coder and freelance designers KingComposer now makes it more easier than ever to style and create within Wordpress. BackEnd editor has a modern interface & ultra-high performance. KingComposer is extremely lightweight in performance. We've spent many hours developing our own unique and stylised UI ( Drag & Drop, Sortable, Draggable, Render Templates, etc... ). KingComposer makes it a truly smooth and wonderful experience in working with large amounts of content. Faster than all other page builders, even when working on livehost. No matter where you are working on your localhost or live host. KingComposer lets you design on the backend & frontend with instant, real time results. All your changes are completed instantly and perfectly, saving you both time and as a developer, money. Outstanding Live Editor. Building your design will be very simple and intuitive. With powerful CSS System of KC Pro, it allows you do everything and view immediately in a real-time preview. So, you will have right-click control panel, powerful CSS system, view the changes instantly in real time, change margin, padding visually, CSS Inspector - unlimited custom, copy, paste anywhere by right-click, hundreds of online presets.